Junior Forward Brandon Borges: I am most thankful for being home on break with my family, and for the bice [bros/boys] on the team, love those boys. Junior Defenseman Nick Staub: I am most thankful for my family. Other than the old age we are all healthy and definitely all happy. We always get to spend the holidays together. And when one of us leaves like when I go off to school the family is always happy when I’m back. My family can be my rock when things aren’t going well. I would do anything for my family just how they would do anything for me. That’s why they are so important to me. Senior Forward Matt Arnold: I’m thankful I have somewhere warm to go during the winter breaks which is Florida. Junior Forward Tyler Scroggins: Thankful for family and friends. Senior Forward Max Willman: I’m thankful for the support of my family and friends! Junior Forward Jack Gethings: I’m thankful for my friends and family. Junior Forward Will Flynn: I’m thankful for having the opportunity to study and play hockey for Williston because I’m getting better in English, I have a lot of new friends that I will stay in touch with after Williston and it is a good experience to live far from Montreal. I’m also thankful for being part of a great team where everyone wants to win and does what it takes to become better individually. All the new guys are a positive addition to our team and I think that after this season, people will have a lot more respect for our program. The Wildcats celebrating the win over Canterbury. The Wildcats defeated the Canterbury Saints 4-2 on Saturday, November 23, 2013, to pick up a big road victory in the first game of the season. This win was critical for setting the tone before getting a week off for Thanksgiving break. The Wildcats had control of the puck in their offensive zone for much of the first period. Just three minutes into the game, a Canterbury defensemen was sent to the penalty box for hooking. This was the first of eleven total penalties in the game. Williston had many opportunities on this power play, including a shot that got past the Canterbury goaltender, but slid just inches wide of the goal post. Senior forward Max Willman put Williston on the board with just under nine minutes left in the first period. He skated down the left side of the rink, put a move on the goalie, and scored. The goal was assisted by junior forward Brandon Borges. With five minutes left in the first period, Williston was called for a hooking penalty while a Canterbury player was on a breakaway. This gave the Saints their first real scoring opportunity. Senior Williston goalie Tim Nowacki saved a backhand attempt by the Canterbury player. This was just one of 35 saves Nowacki had in the game. With three minutes left in the period, junior forward Will Flynn added to Williston’s lead when he scored off of a rebound of his own shot. The goal was assisted by junior forwards Tyler Scroggins and Justin Lindsay. The first intermission ended up taking half an hour due to a Zamboni malfunction. However, this did not seem to affect either team noticeably in the second period. Canterbury started the second period on the power play, one of six the Wildcats killed in the game. With just under 15 minutes to play in the second period, the Wildcats increased their lead to three. Junior forward Jack Gethings had the puck in the corner of Williston’s offensive zone when he passed it to senior defensemen Seth Cupak, who unleashed a wrist shot from the slot, which netted the puck. The Wildcats thought they had scored a fourth goal with under two minutes in the period when the puck found its way to the back of the net. The referees, though, said the puck was kicked in by a Williston player. Coach Cunha told his team to stay focused in the last period and to close out the game. “You’ve won the first period, you won the second. Win the third period, win the hockey game. It’s as easy as that. Do not give them a sniff to think that they are in this hockey game. Finish what you started,” said Cunha. Three goals were scored with less than 2:10 left in the game. At 2:01, Canterbury senior forward Connor Henry netted a rebound. With 48 seconds left, Williston forward Kyle Hall scored an unassisted empty-net goal. Then, with 2.5 seconds left, Cantebury freshman Mathieu Gervais poked the puck into the goal with many bodies in front of Williston’s net. Ultimately, Canterbury was never able to control the puck in Williston’s defensive zone. The Saints’ scoring opportunities came off odd-man rushes in transition. After the team gets back from the Thanksgiving break, it will begin a four game home stand, starting with Kimball Union Academy on Wednesday, November 4th. Note: My apologies for not tweeting updates during this game. I was unable to connect to the Canterbury rink Wi-Fi. I will have this figured out for the team’s next game. “When we leave campus, nothing else matters. Nothing else matters except playing hockey. You guys won’t have any classes, you have no homework. You’re going on break. But before you go on break, you have one really big hockey game to play.” This is what Williston Coach Derek Cunha told the team about this week’s game against Canterbury after its 6-3 win over Académie St. Louis last Saturday, the 16th. The Wildcats are hoping to build on this win as they head down to New Milford, Conn. to take on the Canterbury Saints for the team’s first regular season game. 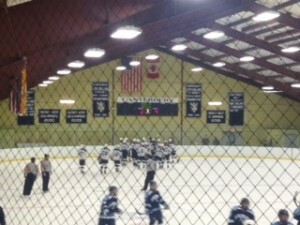 Canterbury also won its scrimmage last Saturday in a 3-0 victory over the Hill School from N.Y.C. The Saints are led by senior forwards Lucas Habich and Mark Bowen, as well as junior Shane Sellar. These three combined for 81 points last season. They keep the puck wide, stretching the ice on offense. Their penalty kill is very aggressive—not just waiting for the other team to make a mistake. The final roster was set yesterday, with two sophomore defensemen sent down to JV. These two players will be practicing with the varsity team during the week, but will then join the JV squad for games. Besides the two goalies who played last Saturday, Shane Mason ’16 and Tim Nowacki ’14, three other goalies have been battling for a spot on the team. Coaches Cunha and Kyle Hanford decided that the three goalies will rotate, with one practicing with the varsity team each week, while the other two will be with JV. The final roster includes a total of 20 players, with 12 forwards, six defensemen, and two goalies. For Williston vs. Canterbury game updates, I will tweeting from the team’s feed, @WillistonHockey. Game highlights, as well as reactions from players and coaches, will available after the game in my game report.